First things first, a belated Merry Christmas to you all! I hope everyone had a wonderful day. 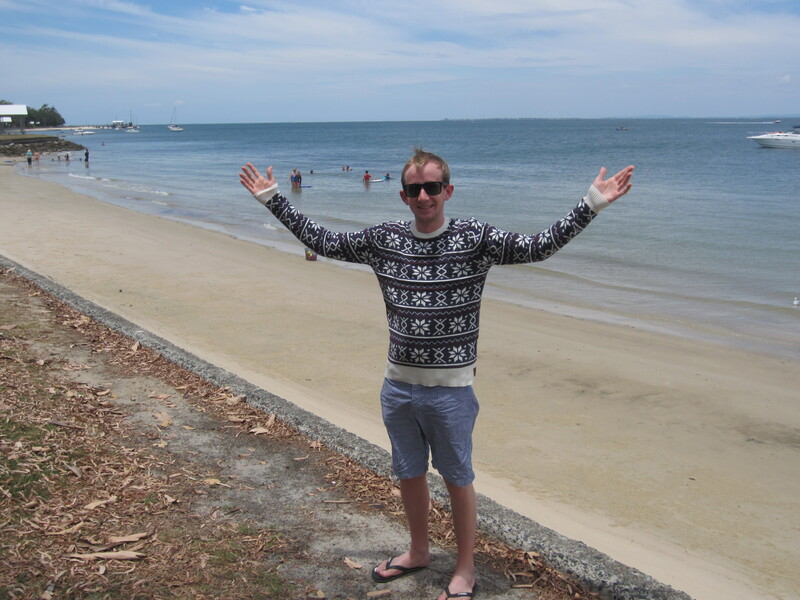 This year marked my first Christmas abroad and away from my family. It was always going to be an interesting experience and I am pleased to say that I had a great time. Things started a little differently to how they would at home. 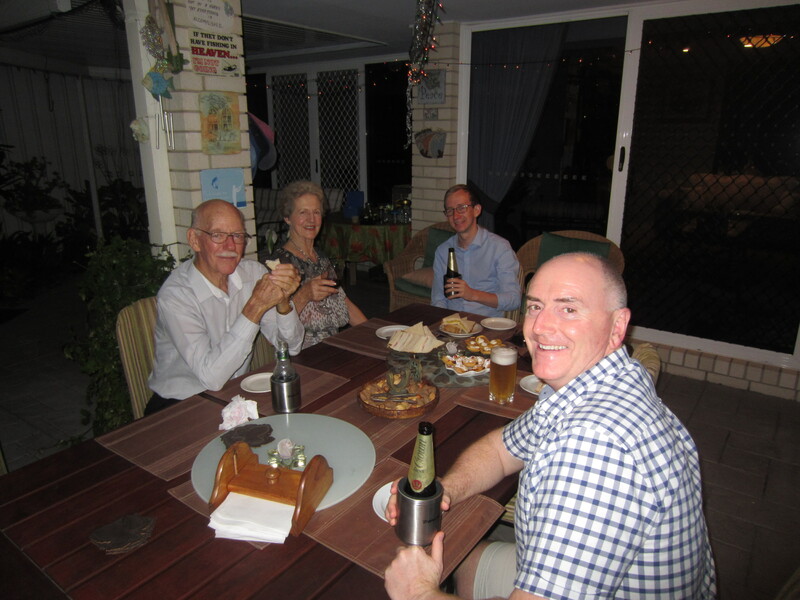 I attended Midnight Mass with my host family; the Vosses, before a swift drink and bed. Not quite the same as the hours of drinking at the pub with the lads back at home, but I did wake up early enough to give them a call and wish them a Merry Christmas before promptly returning to bed. Christmas morning was a slow, lazy and hangover free affair. Brunch was served in the garden and I enjoyed poached eggs on toast and fresh fruit. It was all very civilized. Once cleaned up we headed inside to share some presents. Time for a special mention: my Grandparents. 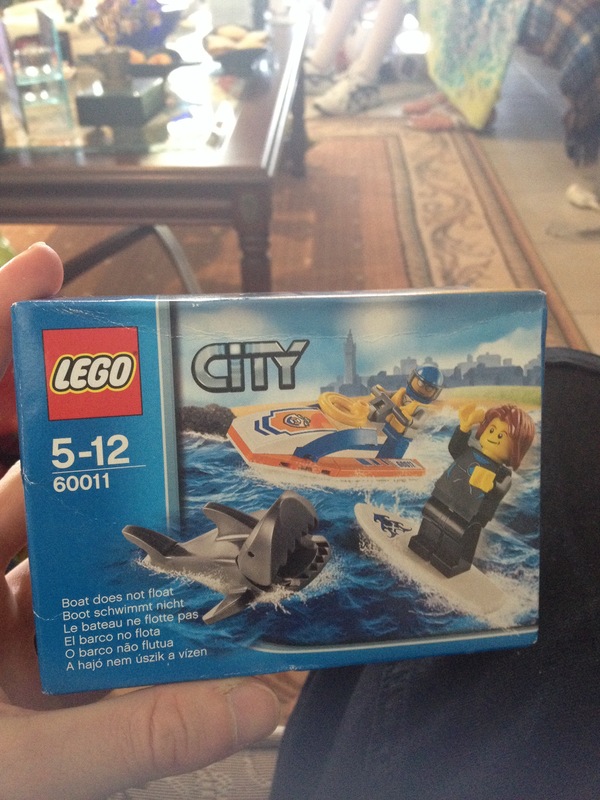 They arranged to send some gifts over and even included a small Lego set to make sure that my Christmas traditions continued. Now, probably time to explain the connection between the Vosses. So I don’t know where things began exactly, but I’ll give it my best shot and I’m sure various people will correct me where I’m wrong. I wish I had the time to put together a diagram to show the connections but here goes! Karen spent two years in the UK and dated a guy called Ant who was friends with my Aunt Jan’s brother. Jan then turned up in Australia at the Voss residence when they lived in Brisbane and stayed with them for some time. When I was 12 my Jan and Uncle Tim met me and my family with Marjorie and Royce at the airport and looked after us on our first few days in the city. Since then, I believe that Tim and Jan, Marjorie and Royce have been back and forth. One of the grandchildren, Kate, spent time in the UK and stayed with Tim and Jan. Finally, just before I came away Marjorie and Royce were in the UK and I went for dinner with them and they invited me to stay at any time. Back to the events of the day; lunch was taken outside as well and once we’d finished up we took the leftovers down to the canal to feed the fish and crabs that live close to the banks. Just as the rest of the family began to arrive, Karen and I took the kayaks out on the canal and had a look at some of the properties that backed on to the water. 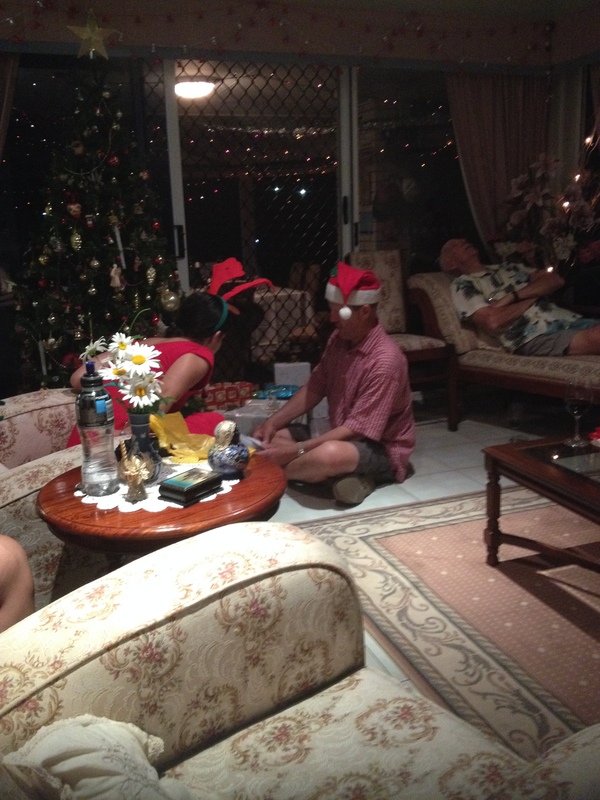 Once we returned everybody else had arrived and we went inside for more presents. Marjorie has a tradition of including a chocolate coin on her gift tags, and her son Gary, who was playing Santa made constant attempts to claim the coins for himself as a Santa-tax. Yet more food was consumed as dinner and desert were eaten outside and everyone eventually reached breaking point and were forced to call it a day. Boxing Day was spent at Gary and Elena’s place with the rest of the family in attendance. The day began much like Christmas, gifts aplenty for everyone. During the gift giving, The youngest of the Voss children, who lives in Boston with his family, came through on FaceTime to wish everyone a Merry Christmas. 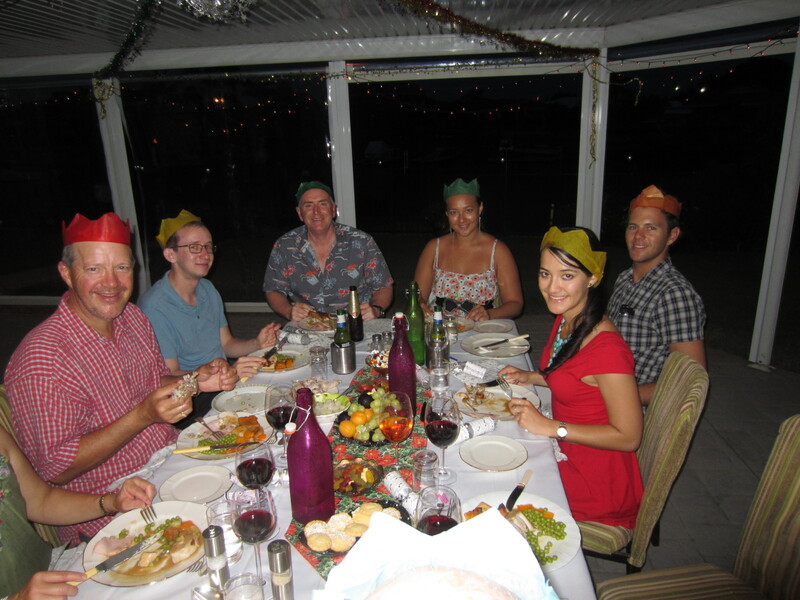 Once we’d finished up with the gift giving, Kate’s partner Drew suggested a spot of fishing off the pontoon. 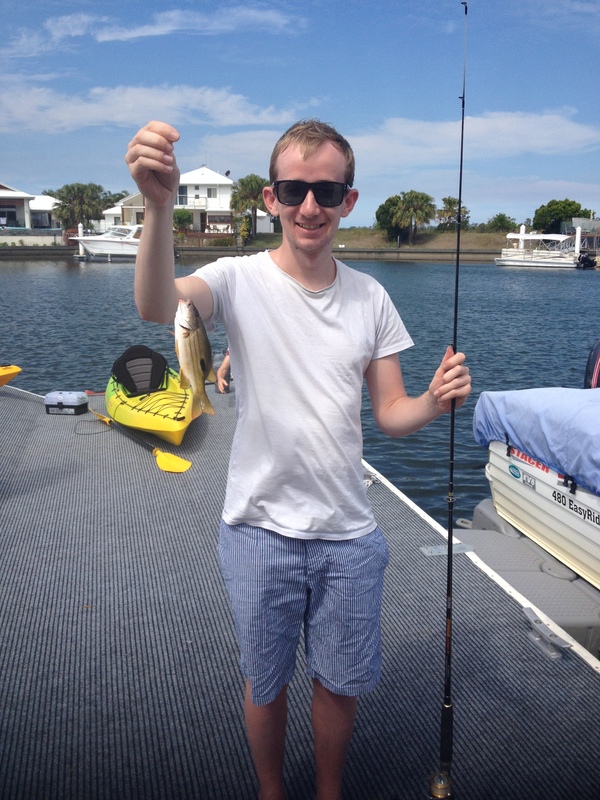 I’ve spoken before about my one and only real fishing trip and I liked to think that I quit at the top of my game but I was talked into learning a bit of the art and it wasn’t too long before I caught my first (and only) fish for the day. Due to the proximity of the pontoon and the majority of the fish there were a couple of lines cast into neighbouring gardens and into Christmas lights. Fishing was followed by a tradition Australian barbecue and I had gotten to a point where I wasn’t sure if I’d ever need to eat again. After lunch the fishing continued and Steve, one of the son-in-laws, who had come up with a double hull catamaran windsurf-kayak offered to take me out and give me my first taste of sailing. 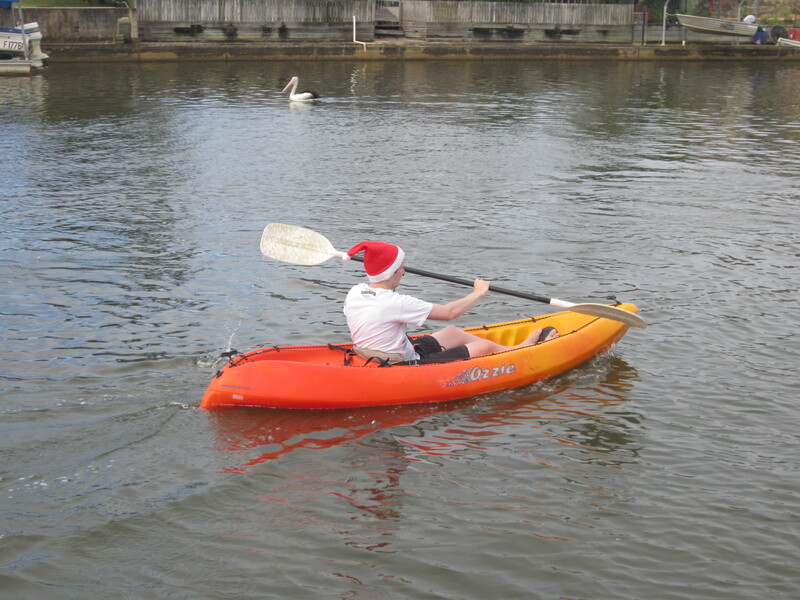 I was very nervous to begin with as I was extremely confident that I’d managed to capsize almost as soon as I’d got in, but following Steve’s instructions I was able to get up the canal and catch the wind. I was well impressed with the speed that I was able to pick up with just a piece of fabric. Much fun indeed. It wouldn’t be Christmas without some board games and Articulate arrived in the form of a present and we had a good round. I was reasonably confident in taking a win with my team-mate Anthony, but after falling behind Kate and Sarah we were unable to capitalise on a later resurgence and finished up in second. Drew had spent much of the afternoon out on the canal fishing and later in the day he’d found himself losing a couple of hooks too eels. 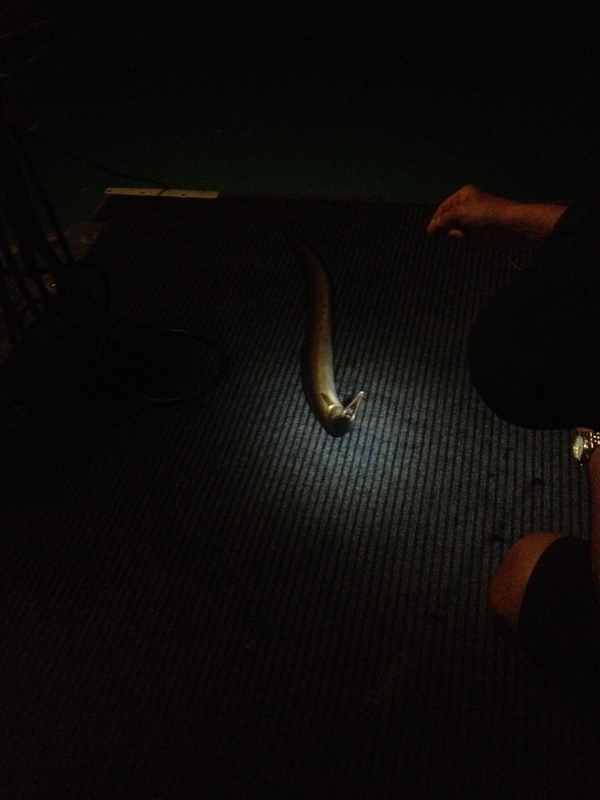 Whilst dinner was served the lines were changed and left trailing and on checking we found an eel had been caught, up he came on to the pontoon were he was de-hooked and thrashed off back into the water. As you can probably see, the events of the day were somewhat different to those at home. Eating outside, I spent the day in shorts and t-shirt, got out on the water a couple of times and yet there were still similarities. 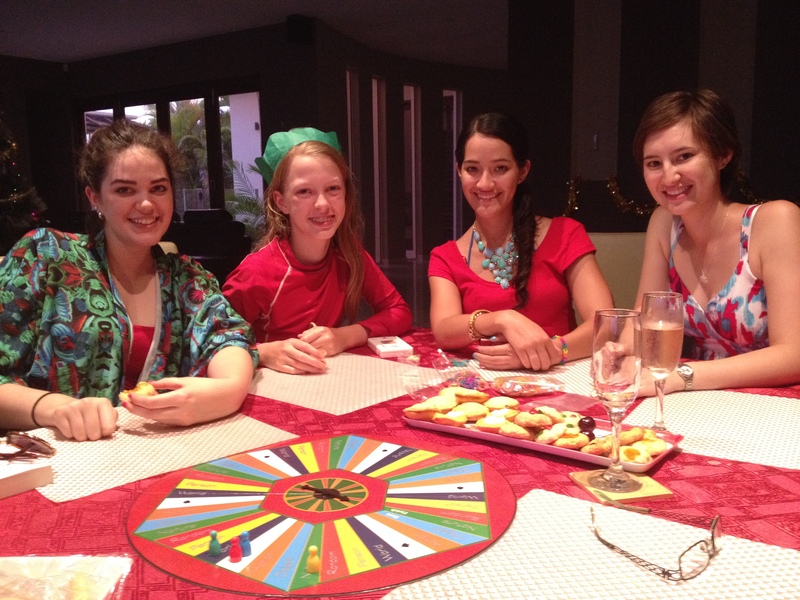 The gift giving, the eating and drinking of far too much and the high intensity family board games. I must give thanks to my most wonderful hosts, who put me up, kept me fed and watered and managed to show me as much of the surrounding area as possible in the short time available. 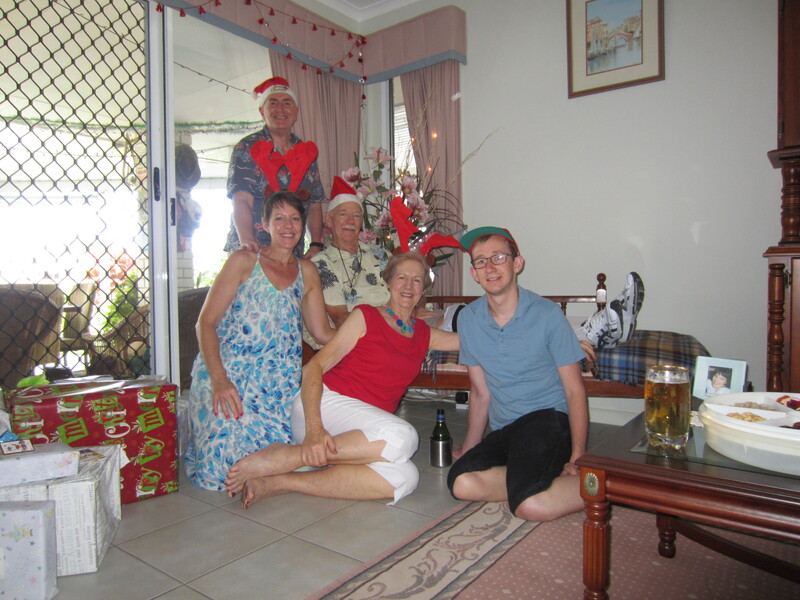 It was great to be a part of a family Christmas, even though it was not my own.